The weather has been terribly warm lately and apart from ice-cream, we have been craving for some cool desserts. 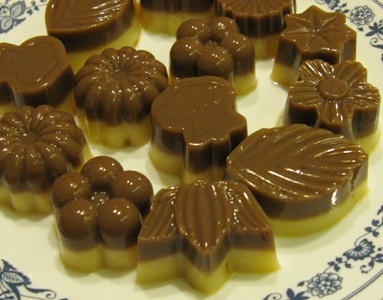 There was a small packet of agar agar powder in the kitchen cabinet and I made some agar agar bites for last night’s dessert. I found this recipe on the internet and modified it a little to further simplify the preparation process. 1. Add water, sugar, Milo and agar agar powder into a pot. Cook until all has been dissolved. 2. 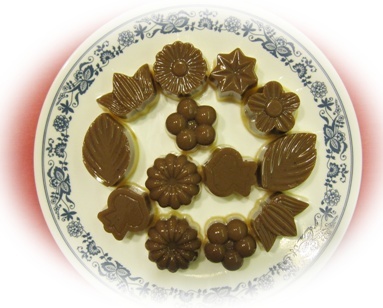 Spoon mixture into jelly mould. 3. Allow to set, then lightly scratch surface with fork. 1. Add water, sugar, agar agar powder and Carnation Low Fat Evaporated Milk into a pot. Cook until all has been dissolved. 2. Stir in vanilla essence. 3. Carefully spoon mixture over the chocolate layer. I think agar-agar milo is delicious. And I think everyone would like to eat it. I want to try to make it so everyone can eat. I've used this recipe a few times already and both my milk and milo layers had no problem setting each time. Did you cook the mixture till it boiled before you poured it into moulds? If it did not reach boiling, the agar agar mixture will not set. Do you cook the water 1st before putting the agar agar powder? Yes, I usually pour agar agar powder in after the water boils. I think this recipe is great but for my school project, I have only 1 hour to do it and we can only make 2 servings which is about 4 agar agar. so can you help me? because my test is on Wed (23/9). Well, I think it will depend if you are able to make everything quickly. It doesn't really take long for the agar agar to set. What I did is to put it into the fridge when a layer is done to get it to set quickly before I did the next layer. Since it is going to be for your exam, may I suggest that you try out the recipe so that you are better able to gauge if you will have sufficient time? Hi, what are the quantities needed for 2 servings? thank you in advanced! The quantities listed in my recipe make about 36 pieces, about 8 servings. So for 2 servings, you'll probably have to use about a quarter of it.